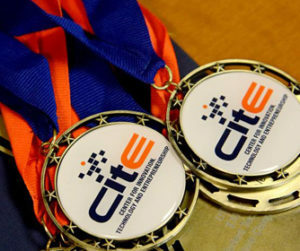 CITE hosts the annual $100K Student Technology Venture Competition to give students hands-on experience as early stage entrepreneurs. Teams of interdisciplinary students work throughout the semester to develop a technology demonstrator and business plan to successfully develop a new company. It encourages intercollegiate partnership for senior design projects that can translate into new startup companies. Download the Student Handbook to learn more about the competition rules and guidelines. For more information about the competition, contact Diego Capeletti.